We will be launching our eagerly awaited new website on 17th July! We will have a brand new range of high-end roll wallpapers, murals, canvases, large scale wall stickers and fine art prints. See the NEW wallpapers brochure PDF for a taste of what's to come, we are especially excited about our WallScene™ wallpapers. 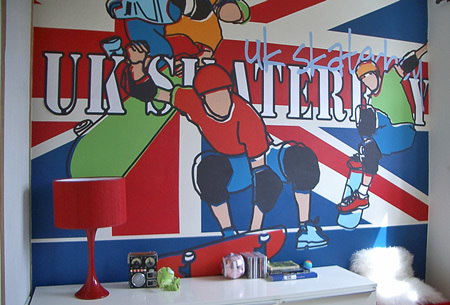 At Funky Little Darlings we custom design unique, contemporary murals printed onto wallpaper and canvases. You can commission us to produce a 'bespoke' designer mural or buy one of our ready-made designs from our new online shop. We believe hip families are in need of designer contemporary wallpaper murals that are exciting for kids and that fit with parents’ cool interiors. Our children's designer wallpaper murals are bold, dramatic and stimulating and are packed full of your children's favorite things - larger than life animals, plants, insects, favorite toys, cars, bikes, games (and even a few dinosaurs). If you are planning a nursery, transforming your children’s bedroom or creating a playroom, our designer feature wall murals will turn your children’s rooms into stylish, dramatic and stimulating environments. And for the more adventurous grown ups we can offer cool and contemporary feature walls for living rooms, dining rooms and kitchens. Our experienced children's designers have 40 years combined design experience and feel that children should be entertained and inspired by their surroundings - our children's wallpaper murals are contemporary, inspirational and above all, fun. Bespoke or stock, our contemporary designer wallpaper murals for children are different to anything you have seen before - this is art on a large scale and we look forward to providing you with the very best in designer children's murals on the market.